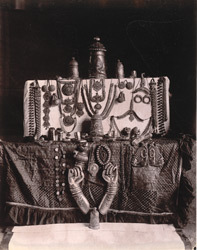 Photograph of a collection of jewellery and armour from the Kumbeshwara Temple at Kumbakonam, taken by Alexander Rea around 1892, from the Archaeological Survey of India Collections. Kumbakonam, in Tamil Nadu, was an important centre during the 9th to 13th centuries under the Chola dynasty. There are fifteen temples in the town dedicated both to Shiva and Vishnu. The Kumbeshvara Temple, built in the 17th century during the Nayaka period, is the largest Shaiva temple in Kumbakonam.